ATMC President Randy “Roachie” Roach presents the collected toys and money to Community Christmas member Pastor Dan Leiker. ATMC members pose with the donated toys for Community Christmas. Once again, the American Thunder Motor Club kicked off the start of the annual Champaign County Community Christmas program on Sunday, Oct. 7. ATMC generously hosted their Toy Run, collecting toys and donations. 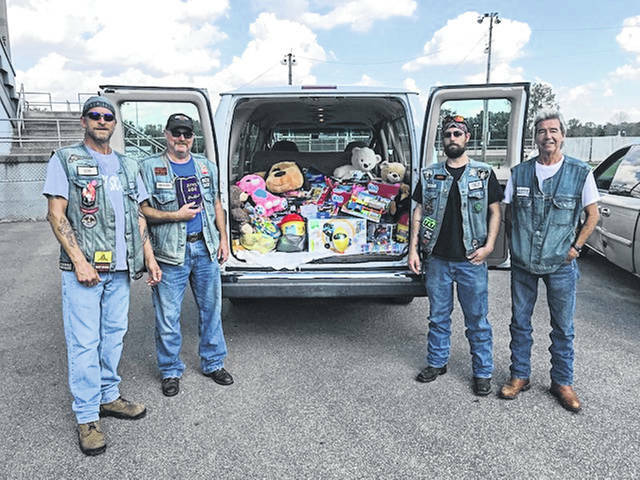 The toy run began at the parking lot of Grimes Airport and ended at the Champaign County Fairgrounds; ATMC club members met with Pastor Dan Leiker to donate over $1,300 and toys. It’s the continued generosity of concerned groups, businesses, churches and private citizens that have made Champaign County Community Christmas a great success for over 20 years. CCCC is a non-profit, county-wide initiative to help families with children and senior citizens during Christmastime. Over 20 years ago, concerned citizens of Champaign County recognized there were families in need and set out to help by assisting them with food and toys during the Christmas Season. Champaign County Community Christmas was born. 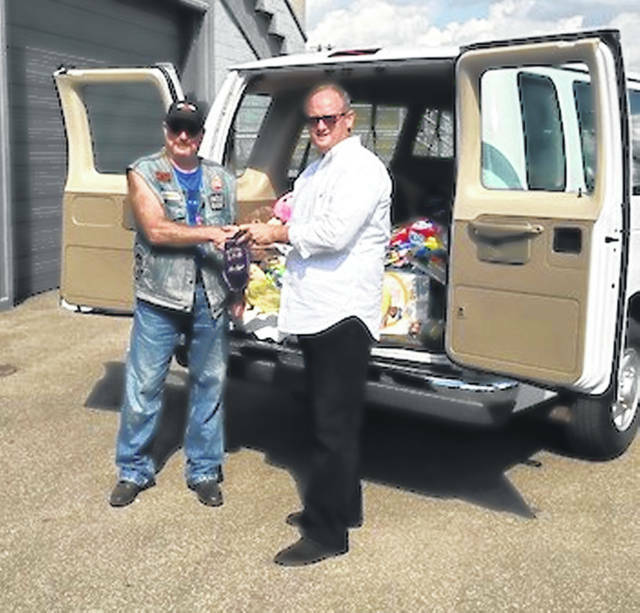 The hearts of citizens from Champaign County – clergy, committed business people and individuals alike – have remained steadfast in serving those in need during the Christmas Season. In its infancy, a canned food drive and donated toys were sorted and distributed through the help of an army of volunteers. It was an awesome outpouring of generosity, shown through community action. This fundamental act of generosity is still seen each year through the outreach of Champaign County Community Christmas. With the technology advances of store gift cards, we are able to give recipients the option to purchase what their children would need or want for Christmas, and to purchase food items sure to bless their families. Likewise, Senior Citizens are able to purchase needed items, whether it’s food or other important necessities. Every dollar donated to this Program is tax deductible and is used to help those in need. No one gets a paycheck from this program, and never has. Champaign County Community Christmas is diligently run by volunteers who are dedicated to help those in need. Three days during the week of October 24, families and senior citizens apply for assistance from this Program. Last year this Program assisted 843 individuals collectively. Without generous support and sponsors from the community this Project is not possible. Tax deductible donations can be made payable to Champaign County Community Christmas, PO Box 294, Urbana, Ohio 43078. This outreach is not possible without the time and commitment of volunteers. The Champaign County Community Christmas Committee and Organizing Team is now made up by representatives from the Champaign County Ministerial Association, area churches, Job & Family Services, The Caring Kitchen, The Senior Center, the Champaign County Sheriff’s Department, the Champaign Cruisers and caring residents of Champaign County. If you would like to assist, please let the Committee & Organizing Team know by calling 937-612-1082. Some of the CCCC Volunteer Opportunities include: coordinating toy donations application sign ups, and assisting with distribution to recipients. Monday, October 22 – 11 a.m.-2 p.m. and 6-8 p.m.
Tuesday, October 23 – 11 a.m.-2 p.m. and 6-8 p.m.
Wednesday, October 24 – 11 a.m.-2 p.m.
Family applicants must reside in Champaign County, must have custodial rights of children on application (all children up to 17 years old and only 18-year-olds who are still in high school will be eligible). To apply: Family applicants must bring all household pay stubs for the most recent four weeks and all income records for everyone in the household (including child support information and Social Security payments), original Social Security cards for everyone in the household as well as the photo ID for the head of household. Senior applicants must reside in Champaign County and must be 60 or older on date of applying. Seniors with custody of children will complete a family application and must meet its eligibility requirements. To apply: Senior citizens must bring with them their photo ID, original Social Security cards and proof of income (including Social Security, retirement, pension, etc.). This program is privately funded by concerned citizens, businesses, groups and churches committed to assist those in need at Christmas time. There is no guarantee that eligible applicants will receive help through CCCC, as the amount of funds available is unknown until right up to CCCC Distribution. The 2018 Distribution Day is scheduled for Saturday, December 1, at the Community Center from 9 to 11 a.m.
https://www.urbanacitizen.com/wp-content/uploads/sites/36/2018/10/web1_CCCC-1.jpgATMC President Randy “Roachie” Roach presents the collected toys and money to Community Christmas member Pastor Dan Leiker. https://www.urbanacitizen.com/wp-content/uploads/sites/36/2018/10/web1_CCCC-2.jpgATMC members pose with the donated toys for Community Christmas. Julie Knopp and Stephani Islam are Champaign County Community Christmas members.